It’s funny how your taste buds change as you get older – if someone had told my ten year old self that I would eventually love mushrooms and asparagus more than my beloved cheese, lettuce and mayonnaise sandwiches, I’d have laughed in their face – but it’s true, the impossible has happened. It’s not just me, even my sister, who used to hate mushrooms so much that she once hid them up her nose to avoid eating them, eats mushrooms happily. Side note – Lis was three, it was hilarious; Mum and Dad had left the room and told her all the mushrooms had to be gone when they got back or she wouldn’t get dessert and returned to her sneezing up mushrooms. Mushrooms are an hearty, healthy vegetarian steak that can be prepared in just about any way you could imagine. Nutritionally, they are high in dietary fibre, iron, magnesium, certain B group vitamins, phosphorous, potassium, selenium and zinc, and they have a moderate amount of protein (3.3 g per 100 g serve); mushies are also low in fat, cholesterol and sodium, for those who need to watch those components of food. Mushrooms contain high levels of the polyol mannitol in 1 cup servings; one or two of these mushrooms is about 1/2 a cup of mushrooms. Eat what you can tolerate. Feta and Parmesan are lower FODMAP cheeses, being lower in lactose than soft cheeses. Use any bread you like for the bread crumbs – spelt, sourdough, gluten free, or grain free are fine. To make these vegetarian, use a sharp cheddar or vegetarian hard style cheese to top instead of the Parmesan, which contains rennet. Makes 16, serves 8 as an entree/canape. The day before you are making the filling, get out the bread and roughly chop it. Let it sit, uncovered, to go stale overnight. Alternatively, if you forget this step, toast the sliced bread before roughly chopping them and blitzing them in your food processor to create bread crumbs. Wash the mushrooms, then carefully de-stalk them and use a teaspoon to dig out the fuzz, so that you just have empty shells. 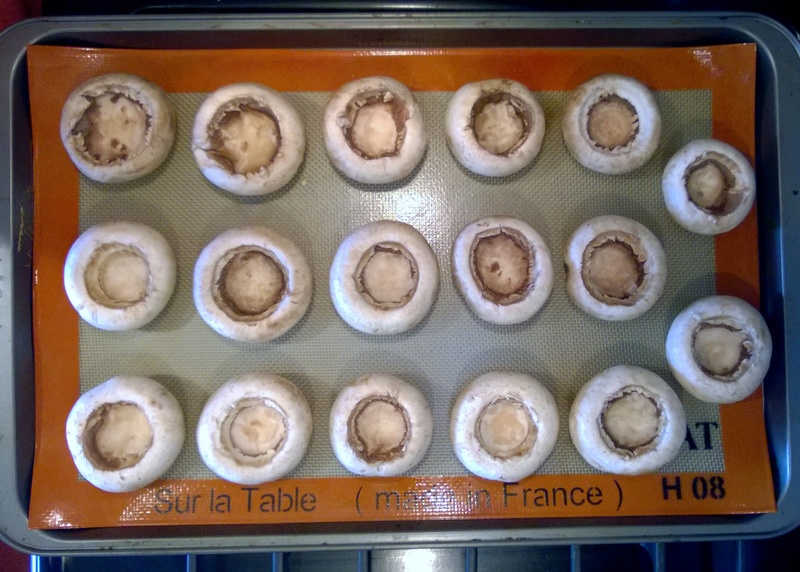 Line a baking tray and evenly space the mushroom tops, upside down. Finely grate the stalks and then saute them in the garlic infused olive oil for 3 minutes, before adding in the pesto, bread crumbs and crumbled Feta cheese. 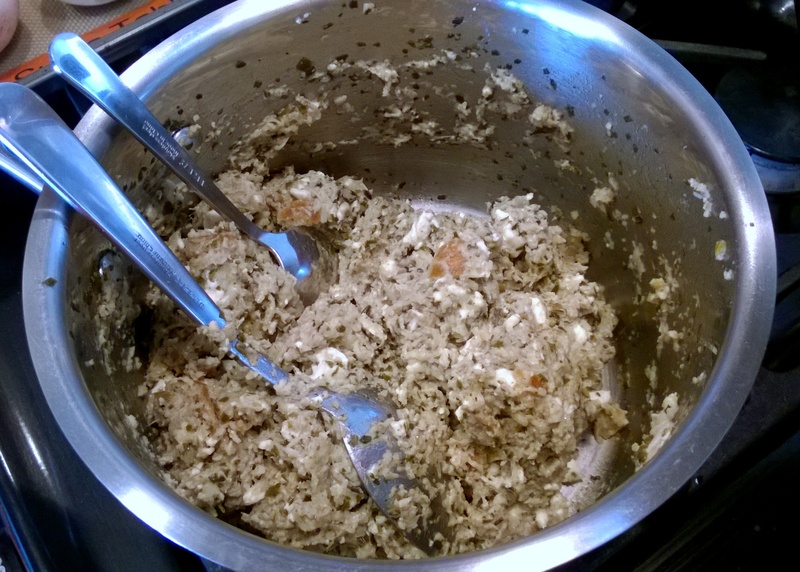 Mix thoroughly and then let it cool completely before filling the mushroom shells. Fill the mushrooms so that the mixture rises above the top by about 5 mm or so, not too much or the Parmesan cheese will fall right off later on. 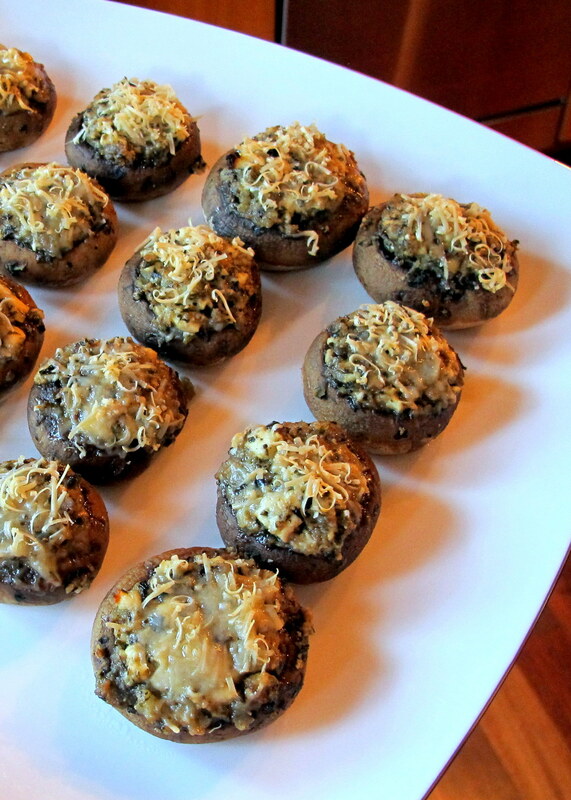 Depending on the size of the hollows in the mushrooms, you could use anywhere from 2-4 tsp. of the filling. You will most likely have some filling left but don’t worry, it makes for a great sandwich spread. 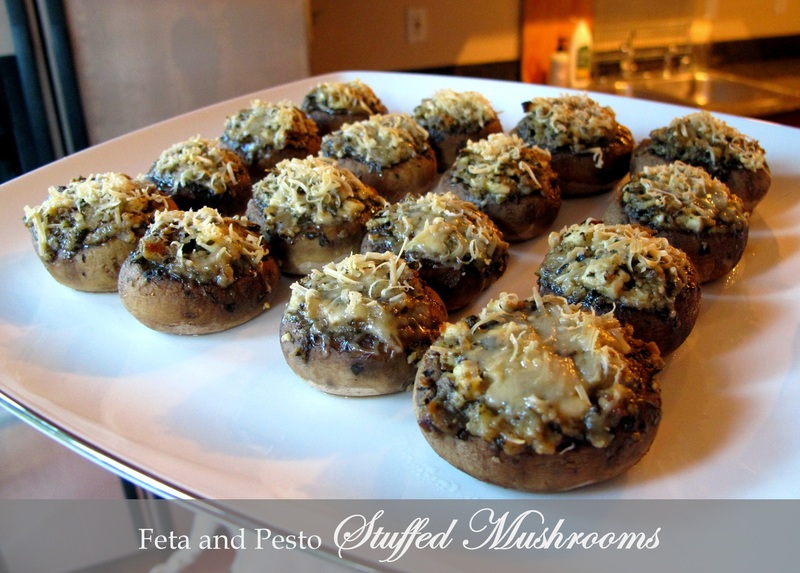 Sprinkle the mushrooms with finely grated Parmesan cheese (or vegetarian option) and store in the fridge until you want to bake them. 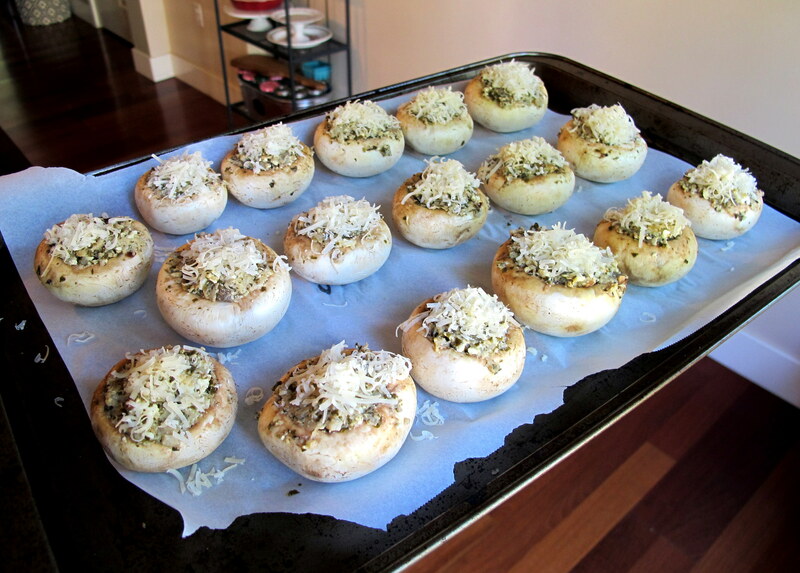 When you are ready to bake (half an hour before serving), have the oven pre-heated to 180 C/350 F and bake the mushrooms for 20 minutes, until al dente. Remove them from the oven and let them sit for 5 minutes, to let the excess juices drain, before plating and serving them. This entry was posted in Entrees, Appetisers and Sides, Vegetarian or Vegan Entrees or Sides and tagged appetiser, Aussie, basil pesto, canape, cheese, dinner, entree, Feta cheese, FODMAP, FODMAPS, fructose friendly, fructose malabsorption, gluten free, healthy, home-cooked, homemade, low fructose, mushrooms, Parmesan cheese, stuffed mushrooms, vegetarian, vegetarian Parmesan alternative. Bookmark the permalink.